The More of Less delivers a empowering plan for living more by owning less. In a society consumed by consumption and stressed about finances, millions are realizing that more "stuff" won't necessarily bring more happiness. Material pursuits, in fact, almost always prevent us from making room for what does. That's why minimalism, defined by the author as "the intentional promotion of everything we most value and the removal of anything that distracts us from it", suggests a radical about face. His book provides a deeply considered manifest for a life-giving alternative: Less is more. Contentment is possible. Generosity enriches. Genuine abundance is not found in wealth. 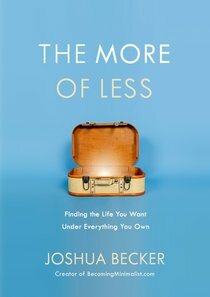 About "The More of Less: Finding the Life You Want Under Everything You Own"
While excess consumption leads to bigger houses, faster cars, fancier technology, and cluttered homes, it never brings happiness. Rather, it results in a desire for more. It redirects our God-given passions to things that can never fulfill. And it distracts us from the very life we wish we were living. The beauty of minimalism isn't in what it takes away. It's in what it gives. JOSHUA BECKER is the founder and editor of Becoming Minimalist, a website that inspires millions around the world to own fewer possessions and find greater fulfillment in life. As one of the leading voices in the modern simplicity movement, Joshua speaks both nationwide and internationally. He has contributed to articles in Time magazine, The Wall Street Journal, USA Today, and Christianity Today. He is a frequent guest on HuffPost Live and has appeared on numerous television programs, including the CBS Evening News. He and his young family live in Peoria, Arizona. I have learned a lot about minimalism in the years since my&#160;garage-cleaning experience. The best of my discoveries appear here in&#160;The More of Less. Yet the point I will keep coming back to is the same&#160;insight I had on that first day: Our excessive possessions are not making&#160;us happy. In America, we consume twice as many material goods as we did&#160;fifty years ago. Over the same period, the size of the average American&#160;home has nearly tripled, and today that average home contains&#160;about three hundred thousand items. On average, our homes contain&#160;more televisions than people. And the US Department of Energy&#160;reports that, due to clutter, 25 percent of people with two-car garages&#160;don&rsquo;t have room to park cars inside and another 32 percent have room&#160;for only one vehicle. &bull;&#160;Less environmental impact&mdash;Overconsumption accelerates&#160;the destruction of natural resources. The less we&#160;consume, the less damage we do to our environment, and&#160;that benefits everyone, including our children&rsquo;s and&#160;grandchildren&rsquo;s generations. Recently, I have been very excited that, through the profits from&#160;this book, my wife and I have been able to create a nonprofit organization&#160;called The Hope Effect. Its mission is to change how the world&#160;cares for orphans by establishing a reproducible model of orphan care&#160;that mimics the family unit. When we had the idea for this nonprofit,&#160;Kim and I said to each other, &ldquo;Why not? Someday, when the time was right, I would have a life-changing&#160;message for him: you don&rsquo;t need to own all that stuff. Customer Reviews For "The More of Less: Finding the Life You Want Under Everything You Own"
This book is life changing! Joshua writes in such a relatable down to earth style. He shares his story of how he found minimalism and how it helped him. I love that he shares his life so much, including the fact that he is a christian, and used to be a pastor. He draws the connection between Christ and minimalism and how the two go hand in hand together. I have learnt so much from this book and would whole heartedly recommend it! Joshua challenged my perceptions of how I relate to clutter and excess things in my life. He explains that "excess" is not "success". He asks hard hitting questions to help you sort through your things such as" Are these possessions adding to my life, or distracting me from it?" And he challenges us to write down our goals and figure out why we want to minimise.